The Choir aims to give a lead to the singing during our Church worship every Sunday morning. The Choir meets on Friday evenings at 7.30 pm to practise the hymns for the following Sunday. Occasionally, the Choir sings a special item during the service, usually as an introduction to worship. 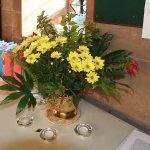 These musical items are often included in special services in the life of the Church including Harvest Festival and Easter and the Choir make a significant contribution to the annual Carol Service.